Performance. Style. Grip. Zip. Introducing the All New Honda Jazz! Life is a stage and you get only one performance. Make it a good one! The above statement is something that deeply resonates with me. The above is something that I strongly believe all of us should aspire for and strive towards. The above is also something that I think Honda took extremely seriously when it decided to build a car for someone who never settles for less. A car that’s BIG on comfort – on space – on mileage and on innovation. Yet small enough to maneuverer you swiftly around the city and across long terrains even, for a relaxed and comforting drive. This is a food blog and normally I do not post auto related content. But this one, is special. This one, is worth it. This one, I have to share with the world. It all started about two weeks back when I heard from Honda. 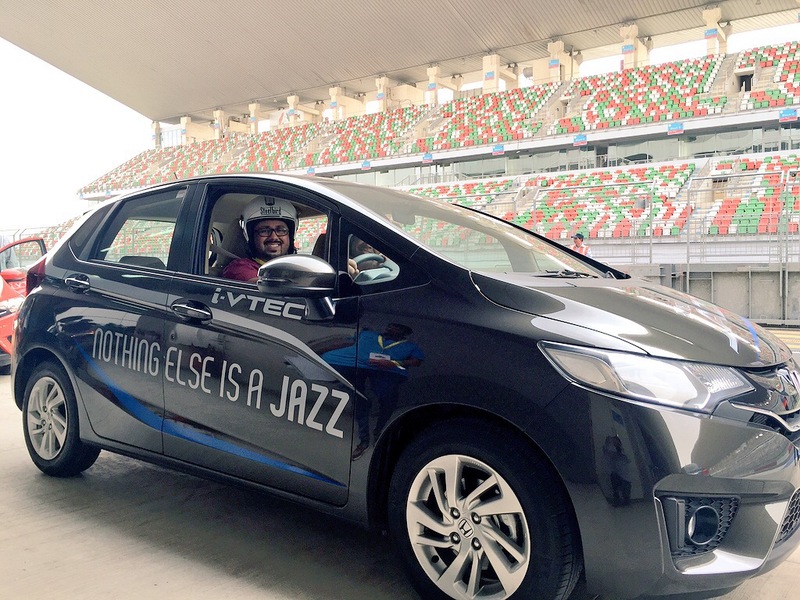 They wanted to fly me down to Delhi and then take me to the Buddh International Circuit – India’s only Formula1 Track to test drive their all new Honda Jazz. I jumped at the opportunity but ofcourse, not only because I wanted to experience the thrill and adrenaline that legends like Sebastian Vettel, Fernando Alonso and Lewis Hamilton experience on the circuit, but also because Honda is a brand that I resonate with. My Dad’s been driving a Honda City for half a decade now and I’ve had the pleasure of driving a Honda Amaze for more than a year. The experience at The Buddh International Circuit was incredible if you will. Just the very feeling of seeing the shiny new Honda Jazz lined up on the circuit gave me the chills. I first inspected the car – was impressed by the exteriors – the shiny new coat of carnedigan red immediately caught my eye. In my very first glance, I was enthralled by the sleek yet suave front grille with premium black gloss and chrome finish right next to which are sporty head lamps that give the Jazz this instant sparkle! If the exteriors are something that awe-struck you, wait till you get into the car. The Jazz has premium and spacious interiors with beige leather seats, an integrated 15.7 cm touch screen to make life a drool when on a ride, automatic air conditioning with a touch screen control panel to pamper you, a multi functional steering wheel with audio control, hands free telephone, an advanced multi information combimeter with eco assist ambient rings and believe it or not – paddle shifts to ensure you’re on the money while driving! Another feature that I was supremely impressed by is that the Honda Jazz comes with four different seating combinations called Magic Seats.What this means is you can configure the Honda Jazz to different seating modes based on your needs. One of my favorite mode is the Witty mode which enables an Jazz to carry a bicycle inside the car – how cool is that! Come to technology – Honda has been delivering on technology seamlessly and consistently for years now and is no different on the Jazz. The Petrol i-Vtech features a 1.2 Litre Engine with 90 PS powered by a light weight and compact cut with torque convertor available in five speed manual transmission. The i-Dtech on the other hand delivers best in segment fuel efficient diesel engine with a promise of 27 kmpl with a 1.5L Engine that roars with 100 PS powered by low friction technology. While the drive across The Buddh International Circuit was dream, the Honda Jazz is nothing short of one. The feel when you get into the car and fire on the engine gives you an uber comforting feeling – the drive smooth as silk, the steering aligns to your hands and the tyres grip the surface giving you balance, stability and power when you need it. I was able to rip the Jazz on the 1.2 kilometer straight at the circuit to about 130 kmph and it didn’t wobble – was steady and gushing for more. If you’re eyeing a car in this particular segment, the Honda Jazz is a bet you’d want to make!